Everyone who comes out with a new product feels as though they’re reinventing the wheel. Most of the time that is definitely not the case, but oftentimes the real change is in smaller aspects that make whatever the item is a bit better than the rest. I’ve seen many more things in crowdfunding campaigns that seem as though they’re really going to take the cake, but there’s always the unknown factor on what the real finished product will be. 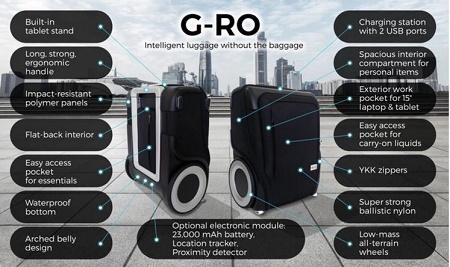 The G-RO carry-on bag was made by someone who travels a lot, so you would think they know what they’re talking about. This is a carry-on bag, but has a spacious interior, exterior pocket for your laptop, pocket for things the TSA might want to see on the front, low-mass wheels that can handle any terrain, a 23,000mAh battery, location tracker, and proximity detector. This is made out of ballistic nylon, has a waterproof bottom, aircraft-grade aluminum handle for rolling, and impact-resistant polymer panels which hopefully means it can handle running between gates and knocking into everything in its path. There’s also a built-in tablet stand and 2 USB ports on the top so you can get to work when you’re waiting on a plane. This bag is going to cost you $279, but if you like that charging station idea, you’ll have to tack on another $99. This bag weighs a good amount at almost 8 pounds on its own, but seems like it would make the traveling process easier. One of the problems with Kickstarter is that opportunistic thieves lurk around there to steal ideas from actual creative people. The entire concept for this luggage was stolen from a long since funded project called “Barracuda: Collapsible Luggage”. Even if this item is better, which it doesn’t seem to be, I wouldn’t recommend anyone back it, as thieves can’t be trusted. Just for the record,the only association I have with the Barracuda project is that I backed it. That’s how I recognized this ripoff.